I love a toffee apple, I do. My first memory of eating one was when I was around 5 or 6, at a Bonfire Night firework party hosted by my infant school. My Mum, Grandma and I had gone along for the evening, and they treated me to a toffee apple (which was exciting for 5 or 6 year old me! All that sugar! Yes! I win! ), but the toffee was so thick and hard that I couldn’t even crack through it. If I remember correctly, the fireworks began shortly after that, I burst into tears (wasn’t fond of the loud noises, you see) and the whole night fizzled out like a soggy Catherine Wheel. Not the best. But! These days, even though having grown up teeth makes eating toffee apples totally manageable, I’m more fond of chocolate-covered varieties. They’re the easiest thing in the world to put together, look far more impressive than their caramelly cousins (in my humble opinion, at least), and would make a beautiful centrepiece for a Halloween party table. Or at least, the kind of Halloween party I imagine fabulous Americans host around this time of year. I’ve never met anyone who’s had a Halloween party here in the UK that wasn’t just all about cat ears on headbands, Pringles, and beer. But anyway! 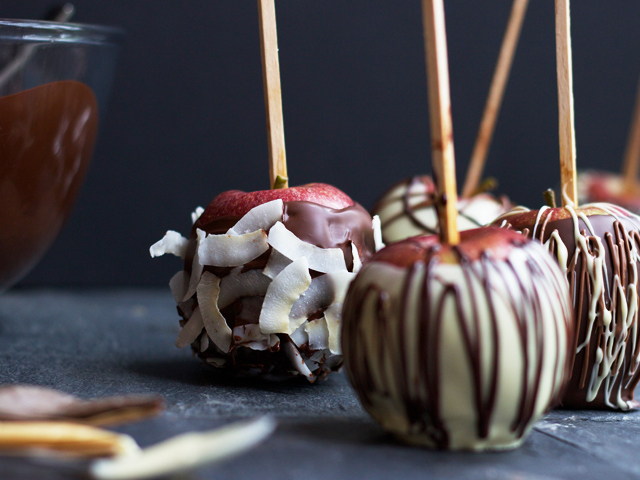 Make these for your imaginary extravagant Halloween party, make them for friends and family as fun gifts, or else just make them for yourself and eat three in one day! Now, let me give you three guesses for the ingredients? 2. Lobsters. Not really, the second ingredient is chocolate, of course. 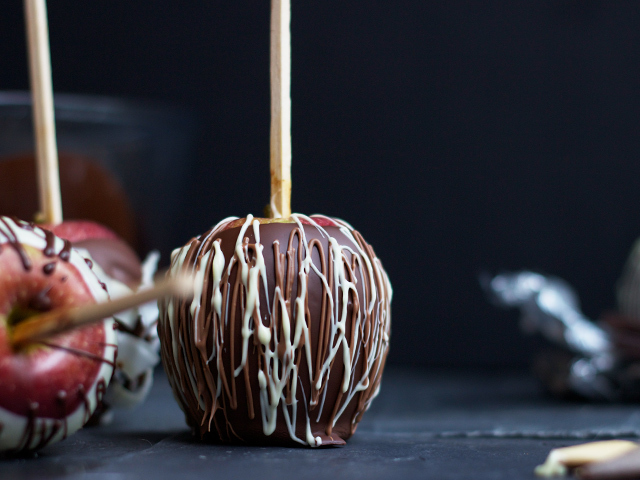 To coat six apples with chocolate, I used 2x100g bars of good quality dark (Lindt’s dark chocolate with sea salt is my favourite of all favourites! ), 1x100g bar white chocolate, and 1x120g bar milk chocolate. 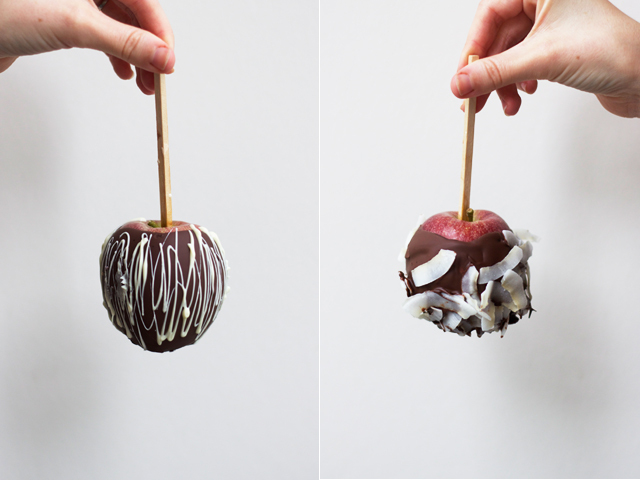 - Take a few of your favourite apples (I used lovely crisp Braeburns), and use a thin, sharp metal skewer to poke a hold into the top of the apple (just next to the stalk) down to about halfway through. Then push a square-edged wooden skewer into the hole you’ve just made, being careful not to push it too far down into the apple. - Melt each of your different types of chocolate in a bain marie (a bowl set over a pan of simmering water), taking care that the bottom of each bowl doesn’t touch the water. 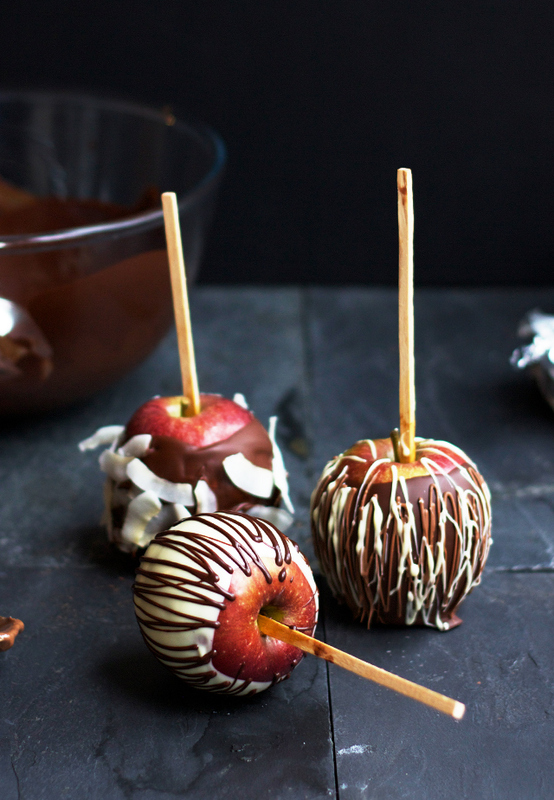 Carefully coat each apple in melted chocolate, making sure that the excess chocolate drains off. If it’s too thick, it doesn’t set nearly so nicely! - To decorate with little ribbons of melted chocolate, cut a circle of parchment paper, then fold it in half once to make a half circle, and then twice more to form a small triangle. Fill up the little pouch with melted chocolate, fold over the top, then trim the tiniest snip of paper off the end of the paper pouch to form a piping bag. Draw a few lines of chocolate onto a board to test the flow of chocolate, then just go crazy! Layering up thin ribbons of different coloured chocolate created my favourite effect. Good quality chocolate melts better than cheaper bars. I tried coating an apple with melted Galaxy chocolate, and it wound up thick, lumpy, and dull-looking. The Lindt bars I used set with a far more beautiful and smooth finish. Umm.. Wow Rosie! These photos are utterly amazing. 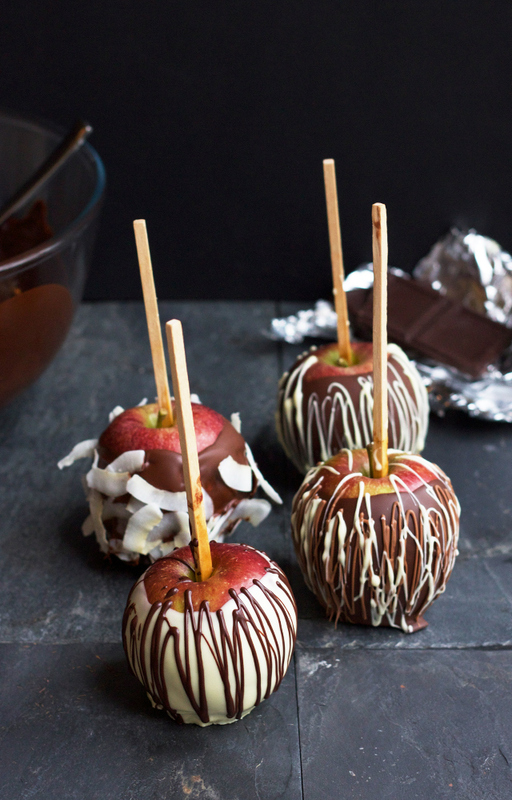 I’m sat here with my coffee now dying to crunch into a chocolate apple… Bring on Halloween, I’m definitely giving these a go! Holy moly! My mouth is watering. My grandma always buys me toffee apples, still now at the age of 25, and if she doesn’t I get quite upset haha! I will have to give this a go it looks so much fun!! Beautiful photos lovely. these are gorgeous! this time of year is the best. we all feel totally justified in letting our sweet teeth reign. it really is the best. these look great! Me and my boyfriend always have an autumn weekend where we decorate pumpkins so I’m going to add these into the reportoire! 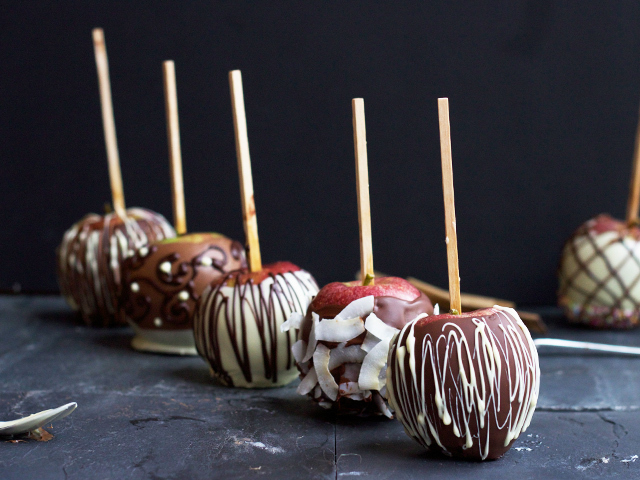 These apples look amazing! I’m American and I wish I could say I’ve been a Halloween party with such a lovely center piece, but the last H-party I went to was zombie themed, so the center piece was chorizo sausage made to look like intestine. 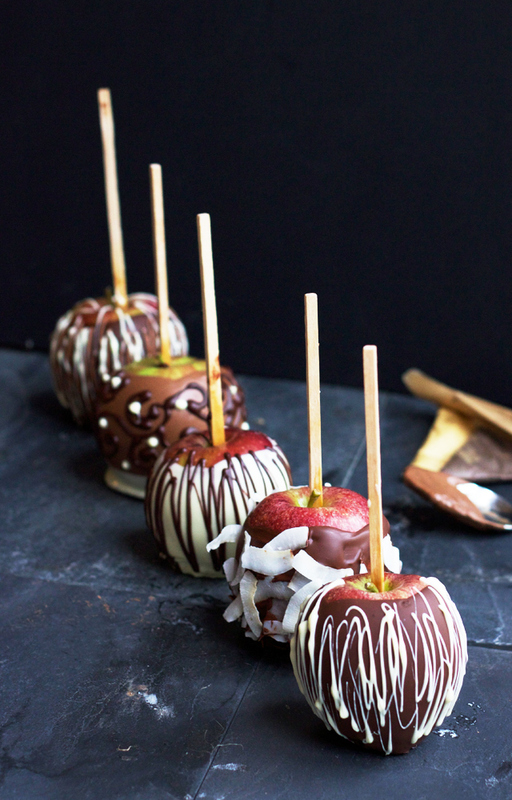 You should throw a party this year and make these apples as your centerpiece. That would awesome, especially with an apple cider cocktail and some little treats. I agree, I really don’t get the fuss about toffee apples. But chocolate apples are a different story! These look delicious!! Such a perfect fall dessert!